Today looks to be the day of iPhone 6S video leaks, with a new video comparing the backplate of the iPhone 6S to the iPhone 6's. Earlier this morning we got a look at what could be the screen of the iPhone 6S, but the video looks specifically at the Bendgate issues of last year, which put the durability of the iPhone 6 Plus into question. Posted by Unbox Therapy, Lewis Hilsenteger alleges to have the backplate of the iPhone 6S, which he compares to both the iPhone 6 and iPhone 6 Plus. 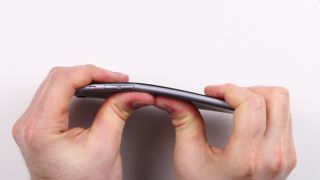 He claims that the backplate shows that Apple has included reinforced sections in its latest handset, which should make the whole thing less likely to bend. The comparison to the iPhone 6 also reveals, according to the video, that the new handset will be just a smidgen bigger than the iPhone 6 - measuring 138.26mm x 67.16mm, instead of 138.09mm x 66.91mm. It's not a big difference, but the video is also claiming that the iPhone 6S will also be lighter than the iPhone 6, supporting rumors of Apple using a different material for the backplate, including Apple's own Series 7000 aluminium alloy or even Liquidmetal.